. This was one of my favourite designs because of the cute rabbits and birds with the bold message on the front. 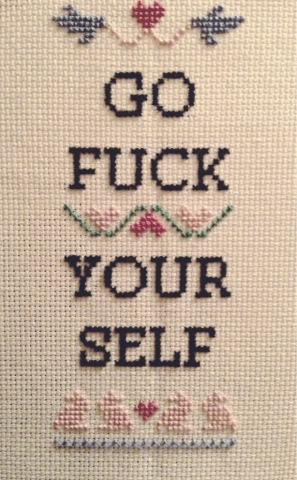 I think it's exactly what cross stitching needs to modernise it and bring a new audience to the craft. 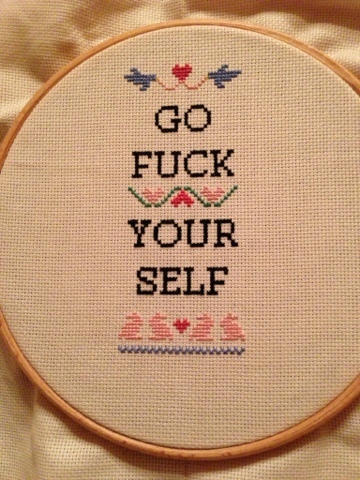 Teenagers don't want to cross stitch cherubs and clouds. This is it in the loop I was working it on. I highly recommend the book for anyone who enjoys cross stitch but is stuck on patterns. I like how cute it is when you first see it then you realise what is has to say.